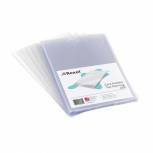 Q-Connect Card Holder Polypropylene A4 (Pack of 100) KF01947 Pack of 1 Q-Connect Card Holders. 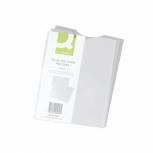 90 micron polypropylene pockets open one side with thumb hole for easy page insertion. Size - A4. 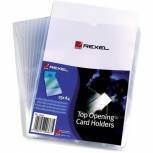 Rexel Nyrex Card Holder Open Top A4 Clear (Pack of 25) PGCA41 12081 Pack of 1 Glass clear Nyrex protection for all types of material. Contents remain neat, clean and clearly visible, particularly useful in garages, workshops etc. Sealed on three sides for complete protection. Open at short edge (with thumb hole). A4. Card Holders F/Cap pack 100 Pack of 1 Contents remain neat, clean and clearly visible, particularly useful in garages, workshops etc. Sealed on three sides for complete protection. 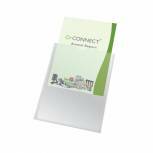 Q-Connect Card Holder Polypropylene A5 (Pack of 100) KF01948 Pack of 1 Q-Connect Card Holders. 90 micron polypropylene pockets open one side with thumb hole for easy page insertion. Size - A5. 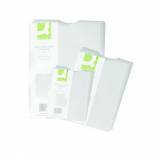 Q-Connect Card Holder Polypropylene A6 (Pack of 100) KF01949 Pack of 1 Q-Connect Card Holders. 90 micron polypropylene pockets open one side with thumb hole for easy page insertion. Size - A6. 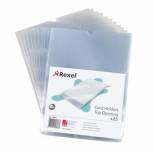 Rexel Card Holders Polypropylene A4 Clear (Pack of 25) 12092 Pack of 1 Manufactured from strong, clear embossed polypropylene to protect important documents in any environment. Keeps information neat, clean and immediately visible. A4. 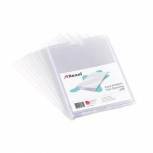 Rexel Card Holders Polypropylene A5 Clear (Pack of 25) 12093 Pack of 1 Manufactured from strong, clear embossed polypropylene to protect important documents in any environment. Keeps information neat, clean and immediately visible. A5.